Activities that are conducted while equipment and system are in service. These activities are predictable and can be scheduled, staffed and budgeted. Generally this are schedule on a time –based, run time meter or number of operation schedule. Activities that involved the use of electrical test equipment to determine electrical equipment RELIABILITY in an offline state. Activities that involve use of test equipment to access condition of equipment after unusual event such as faults, fire or equipment failure/repair/replacement or when equipment deteriorate is suspected. Resistance (in megohms) offered by the insulation to an impressed direct voltage. Insulation Resistance is NOT a definite measure of the voltage an insulation will stand, its is an indicator of the suitability of the insulation for continued service. The time resistance test is independent of equipment size and temperature. It compares the absorption characteristics of contaminated insulation with the absorption characteristic of a good insulation. The test voltage should be applied over a 10 minute period with the data recorded every 10 seconds for the first minute there after. The interpretation of the of the slope of the plotted graph will determine the condition of the insulation. A continuous increase in resistance in the graph indicates a GOOD Insulation. 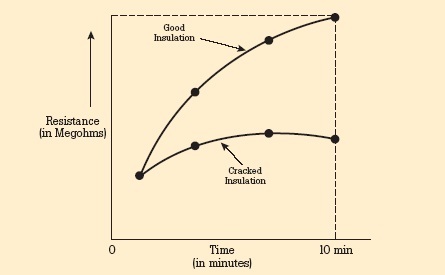 A flat or downward curve indicates cracked or contaminated insulation. The steepness of the dielectric absorption curve taken at a given temperature indicates the relative dryness of the insulation. Polarization Index = R10 / R1 = The value must be more than 1. The purpose of this test is to determine the state of dryness of the winding and insulation system and to determine the power factor for overall insulation, including bushing, oil and winding. It’s a measure of the ratio of power losses to the volt amperes applied during the test. The power factor obtained is measure of watt lost in the transformer insulation system including the bushing. This is to check the loose connections and broken strands. The most accurate method is to allow the transformer sit de-energized until temperatures are equalized. Take the reading from the top of each bushing to neutral for wye and across each pair of bushing for delta. Result are compared to other phase in wye connection or between pairs of terminal on delta connected winding to determine if a resistance is too high. Resistance can also be compared to the original factory measurement. Investigate and deviate from adjacent pole or similar equipment / devise by more of 25% of lowest value. TTR detects shorted turns which indicates insulation failures by determining if the correct turns ratio exist. Shorted turns may result from short circuit or dielectric (insulation ) failure. Measures are made by applying a known low voltage across one winding and measure the induce voltage on the corresponding winding. The voltage ratio obtained by the test is compared to the nameplate voltage ratio. The ratio obtained from the field test should agree with factory data, within 0.5%. New transformer of good quality normally within 0.1%. I have enjoyed reading your articles. It is well written. It looks like you spend a large amount of time and effort in writing the post. I am appreciating your effort. . I just wanna thank you for sharing your information and your site or blog this is simple but nice article I’ve ever seen i like it i learn something today. Thanks for sharing such a great post about Electrical Testing. Very helpful. This site is good because they give us a new thing and new ideas and new topic how good all of they are we should appreciate them because of these good thing. Test and Tag Brisbane is committed to providing appliance safety solutions whilst delivering the highest level of quality service excellence. We offer a large range of electrical testing services. This is a authorized requirement that all these types of appliances are tested consistently in order that These are electrically Risk-free for use. we can also help to save you money through better electrical wiring and more efficient cooling of your property. there may be a way we can improve on what you already have. Let us know what you have and the kind of business you have and we will consult you on whether you have the best system or not. Servicing customers in need of new electrical installations, repair and maintenance and protection inspections. Our Electric powered contractors are going to be Completely ready to aid. We provide specialized provider and help, be it commercial or residential. and obtain a restriced contractors license (Notice – this isn’t similar to a limited electrical license). Call us or the QLD Electrical Protection Business For more info. Tes and tag would want to be the organization responsible for this For many years to come. The moment entered into our database we do many of the function. Nearing the expiration within your asset tags we’ll Make contact with you and book a suited time for you personally. Provided that you’re our consumer, your Test and Tag will be our accountability. It's important to remember that when you're testing and tagging a laptop, you're basically doing it in two parts. Electroy can help you to save a lot of money with things like the best solar panels Brisbane has to offer. the electricity you need without causing any structural damage to your home. Brisbane Electrical Contractors is really a household owned and operated electrical contracting small business that has in depth field working experience. You need target visitors for your website this may try some for freeto you? we have a VERY POWERFUL and POPULAR company now lets try to know their traffic service. Test and Tag Brisbane is dedicated to making sure that the Independent Test And Tag has minimal impact on your business. electricians LiverpoolYou can depend on DTF Electrical Contractors Limited for your electrical contracting projects. So if you have a project you’d like to discuss, give us a call. We can take on projects of any size or duration, from 1 day contracts to ongoing contracts. There’s no obligation and it will give you a clear idea of how we could help. Emergency Electrician Liverpool :- Specializing in both Electrical and Plumbing Services AUSSIE AEP is one of the finest Electrical and Plumbing Services in Sydney. Thank You for sharing your wonderfull information .This is very nice information about this .Thank You and shareing this.